I think the warm weather is here to stay here in Dallas. It’s been in the 80s all week. So it was about time to break out the popsicle molds . Eating clean does not mean you need to miss out on frozen treats. Making your own popsicles allows you to control the ingredients. These peaches and cream popsicles have only a few simple ingredients. My kids both love peaches so I created these peaches and cream popsicles for them. If you wish, you can also pour this mixture into an ice cream machine to make ice cream instead! If you enjoy this popsicle recipe, you may also enjoy my blueberries and cream popsicles or my dairy free fudgsicles. 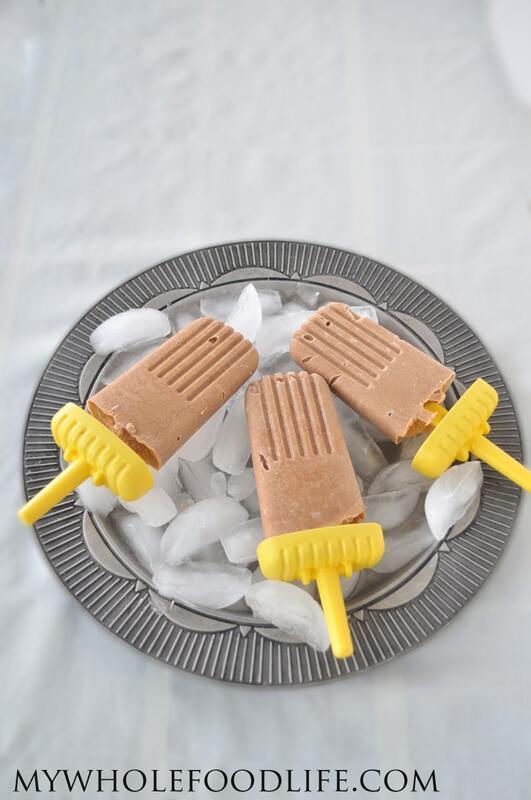 These peach popsicles are dairy free and contain very little added sugar. In fact, you can omit the sugar all together if you get some super ripe peaches. My peaches were slightly on the tart side, so I added a little maple syrup. Combine all ingredients in a blender . Pour contents into popsicle molds . Fun! Can't wait until we have 80 degree weather up here in Indiana! I look forward to making popsicles for my kids soon...these look great! I think this is the year I'm going to get myself some "popsicle moulds". I'd love to make homemade lollies (that's what we call them here in England :) ) Peaches and cream sounds to die for! Can't wait for summer and peach season! Popsicles are so delish and the perfect treat for summer! I just bought an ice cream maker half off at Market Street! Woo-hoo!!! Thank you so much for creating these delicious recipes!!! Nice! I hope you enjoy the recipe! I think it would be good with any fruit. Hi. I'm thinking of making avocado popsicles...do you think avocado would go well with coconut milk? What other ingredients can I add? Thanks! Yes! I would add some cocoa powder or cacao powder too. Maybe some maple syrup?